UPDATED: Marit Bjørgen, who just became the most-winning Winter Olympian of all time, has decided to retire from professional cross-country skiing while she’s still the world’s reigning ski queen. She’ll ski her last race on Saturday in the Norwegian championships now underway in Alta. Bjørgen, at an age of 38, is definitely leaving while still on top of her sport. 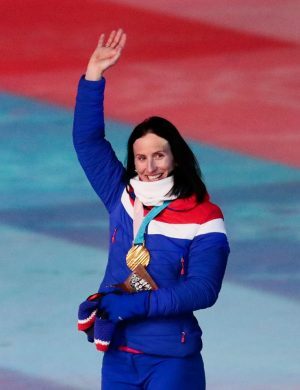 She won even more gold medals at the recent Winter Olympics in South Korea and was applauded by the entire Olympic stadium at the closing ceremonies, for having won more Olympic medals over the course of her career than any other athlete, man or woman. Her decision follows biathlon star Ole Einar Bjørndalen’s tearful announcement earlier this week that he also was reluctantly retiring, at an age of 42. He had previously held the Winter Olympic medal record that Bjørgen won away from him, and had resisted retiring for years. After a disappointing final season during which he didn’t even qualify for the Olympic team, Bjørndalen called it quits. Bjørgen has chosen to leave while still a champion, a move that likely will also leave her remembered as a winner. Over the course of her career, she has won 18 World Championships in addition to her eight Olympic gold medals. She’s also won 141 World Cup races and been on the winners’ podium 184 times after taking part in 303 World Cup events.